I love Parker Urbans. This is my third; in this post I talk about the blue one my dad bought me, and in this post I talk about the Urban gift set I bought from Amazon. I had to have this brown metallic one, because of the great price, but also because the finish reminds me of chocolate ice cream. Also the lines on the barrel give it a science fiction kind of feel, for me, for some reason. Absolutely nothing wrong with the nib. And it writes beautifully. 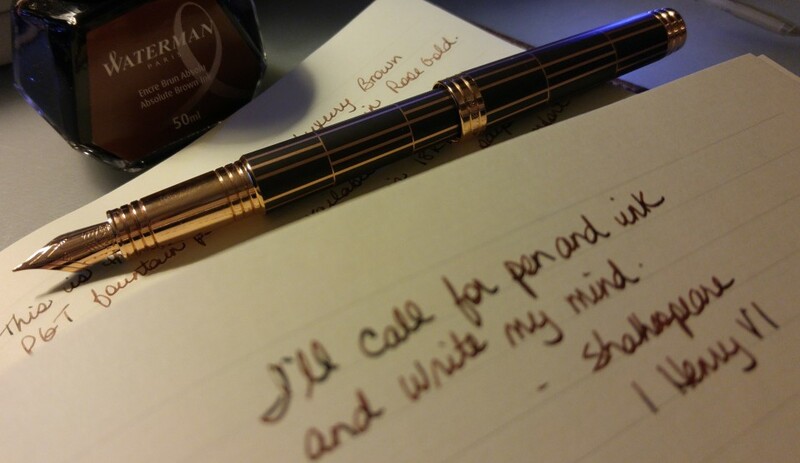 Here’s a writing sample on Rhodia paper. Black was the only choice of ink, given the black clip, rings and section. A black nib would have been amazing. And here are the three Urbans together. So that’s my happy experience with Amazon Warehouse Deals. Anyone else have experience with this service? Let me know in the comments. Oh they look lovely. I’m so tempted now. Thanks. I’m sold on it now. I will definitely look for them on Amazon. In general Parker always makes good pens, I’ve been using their ball points. Oooh. I’ve heard of the amazon warehouse deals before, but didn’t know you could find FPs there!